Safaga is a city by the Red Sea, approximately 55 km from Hurghada. The city was founded in 282 BC and the majority of its population of 35 000 citizens work in tourism. Safaga is a port which is connected with Jordan and South Arabia with sea-path. Astounding reefs to explore, amazing kite and wind surfing conditions, never-ending beaches of black and gold sand dunes, a cultural day trip to Mons Claudianus where lie the remnants of a Roman quarry, the peace and serenity of a start-up touristic destination... that’s what Safaga is all about. Once a small port town, exporting its abundant phosphate to the rest of the world, Port Safaga has grown into a major touristic hot-spot on the Red Sea! And a world-famous water-sports destination; it has even hosted the 1993 Red Sea World Windsurfing Championships; kite and windsurfing in Safaga is really something else! Safaga enjoys an all-year-round pleasant climate, but the best times to visit Safaga are definitely the months from February to June and September to November, when temperatures range between 25 C and 30 C. Divers will also be tempted to come in the hotter months of summer, when water temperature reaches peaks of approximately 28 C.
People come to Safaga from all around the world to enjoy the sun, the sea, and the exciting water activities on offer – which include diving the Abu Kafan Reef, the Panorama Reef, Ras Umm Hesiwa and Sharm El-Naga – but they also come for the curative properties of this paradisiacal Red Sea destination. Indeed, the black sand beaches, the town’s clean and healthy climate, and the highly saline waters of the Red Sea make Safaga a perfect holiday destination for those who suffer from diseases such as psoriasis or rheumatoid arthritis. Safaga is said to be one of the best locations in the world for curing psoriasis. Book a wellness holiday at the Menaville Resort & Spa in Safaga to experience the curative properties of the town’s environment. You will find long, sandy beaches in Safaga where you can observe many small islands in the sea. The tourism of this port is based on diving and other water sports. The water of the Red sea contains many minerals that are good for the skin, especially for people who suffer from arthritis. In 1993, a world wind-surfing championship took place in Safaga. North from the city, a corral reefs can be seen and one must be careful while diving as there are some aggressive sharks swimming around. 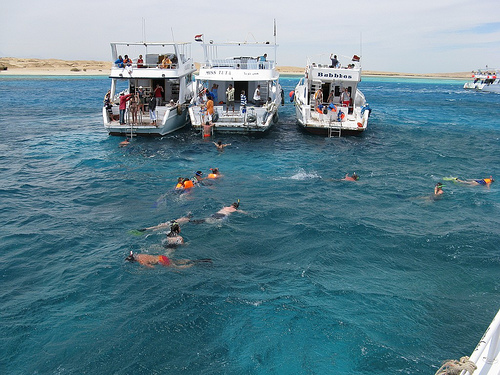 The most popular spots for diving are the Abu Kafan reef, the Panorama reef, Ras Um Hessiwa and Sharm El-Naga. Diving in the Salem Express can be a truly unique experience. The Salem Express sunk in 1991 and its wreck is lies in the Red Sea. It is allowed to visit the wreck; however, some companies will refuse to guide you there because of the ethical issues. But it doesn’t mean it is impossible to do so. In fact, visiting the site is something strongly advised for those who are fond of diving. Safaga was a merchant port for many years; now the town, with its wide azure bay, long sandy beaches and pretty islands, is a favourite sports destination in the Red Sea Riviera. Safaga is especially popular among kitesurfers and windsurfers, and was the host of the 1993Red Sea World Windsurfing Championships. At 53 km (33 mi) south of Hurghada, Safaga acquires its unique character from both its port and the small surrounding village. A holiday in Safaga is mainly about watersports and sightseeing, with little nightlife around, except for some beach parties organized by the local divers and surfers. The black sand dune beaches characteristic of Safaga are a favourite spot for sun bathers. The sea water is known to be highly saline and rich in minerals which are beneficial for the skin, and it is a popular curative destination in the Red Sea Riviera. Safaga is also home to some of the most outstanding diving of the Red Sea, with the bay’s chain reefs of Tobia Arbaa, and the impressive walls of Panorama and Abu Qifan towering reefs, where often big pelagics such as tunas, sharks and mantas can be spotted. Safaga is also a good starting point for a day trip into the Eastern Desert to check out the granite quarries of Mons Claudianus, or to the sights of Luxor, one of the most impressive sights of Egypt, only 220 km (140 mi) away. Tobya Hamra, also known as the Coral Garden, is a spectacular and multifaceted coral reef. At a depth of 5 to 30m (16-98 ft.), you'll see colorful formations as well as moray eels, octopus, stonefish, and sometimes eagle rays. Panorama Reef is a big 400m (1,312 ft.) block of vibrantly colored reef that goes down almost 35m (115 ft.) at the southern end and offers the possibility to see eagle rays and the occasional white-tipped and hammerhead sharks. Turtles sometimes lurk at the northern end. The 100m (328 ft.) Wreck of the Salam Express ferry sank in 1991, and the debris field and bridge are accessible to divers. Just off the Sheraton Soma Bay beach, the eponymous Seven Pillars rise up from a depth of between 10 and 12m (33-39 ft.) and are usually surrounded by multicolored flora and fauna. There is a resident Napoleon fish here that is used to humans, as well as puffer, lizard, and lion fish. Several companies around Safaga can arrange a day of paintball. Or, spend a full day or just an hour or two exploring the desert around Safaga on a quad. Destinations include a now-abandoned Bedouin village. Soma Bay features an 18-hole par-72 golf course designed by South African golf legend Gary Player. The course has stunning views of the desert, the mountains, and the Red Sea, and, of course, a great bar on the 18th hole. Facilities also include a 9-hole "Golf Academy" practice course and a 60-bay driving range. A combination of warm water and reliable, strong winds (on average one Beaufort stronger than off Hurghada to the north) combine to bring an increasing number of windsurfers and kitesurfers to Safaga. Not only do winds whip up exciting offshore waves, but the relatively sheltered bay means good flat water for beginners. 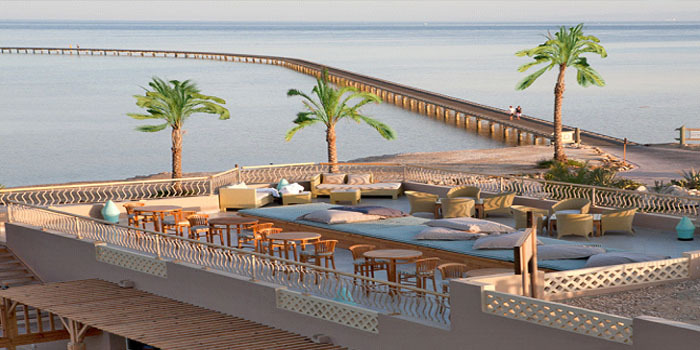 is located in the heart of Soma Bay and is known for its service and comfort. It offers uninterrupted views of the beach, stylish rooms with in-room movies and personalised service. Guests staying at the Sheraton Soma Bay Resort can make use of a variety of on-site recreational activities, including windsurfing and fishing. Relaxation options at the resort include a sauna and a spa & wellness centre. A 24 hour reception, a lift and an outdoor pool are also available at the resort. The spacious rooms at the Sheraton Soma Bay Resort offer tea and coffee making facilities, cable / satellite channels and a hair dryer. Amenities featured in the rooms include bottled water, a mini bar and a refrigerator. For extra comfort slippers and bathrobes are also included. With a selection of Italian and International dishes, the Sheraton Soma Bay Resort's on-site restaurant offers a variety of delicious meals for guests to sample. A bar is also at your disposal, and room service is provided around the clock. Packed lunches can be prepared on request for guests with day trips planned. The Sheraton Soma Bay Resort provides free parking for those travelling by car. Snorkeling and hiking are available nearby. 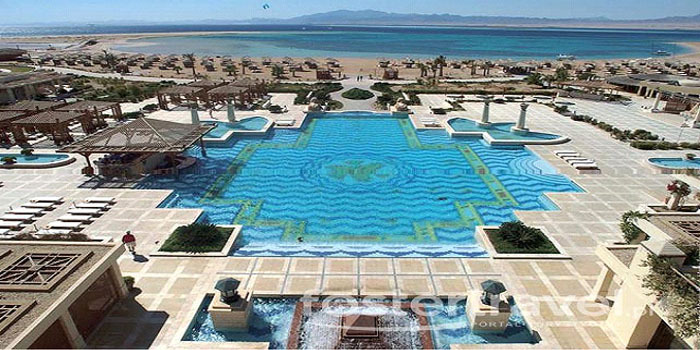 Featuring a spa and 3 pools, Moevenpick Resort Soma Bay offers luxury accommodation in Soma Bay. With its own private beach, this 5-star hotel provides water sports activities such as diving and windsurfing. The uniquely decorated units at Moevenpick Resort Soma Bay feature a modern décor and azure furnishings. Each room and suite comes with a flat-screen satellite TV, minibar, tea/coffee maker and private bathroom. Moevenpick Resort Soma Bay has an à la carte restaurant which serves a variety of cuisines and provides 24-hour room service. You can unwind with a fresh cocktail or snack at the pool or beach bar. A range of treatments is provided at the spa, where you can relax with a sauna or request a massage. You can make use of the hotel’s tennis court and enjoy a game under the sunny weather. Hurghada International Airport is 45 km away, and Senzo Mall is 20 minutes away by car. A free shuttle can be arranged upon request. Offering an outdoor pool and a jacuzzi, the Kempinski Hotel Soma Bay is a boutique resort set in the centre of Soma Bay. Guests can enjoy free access to the resort's private beach. 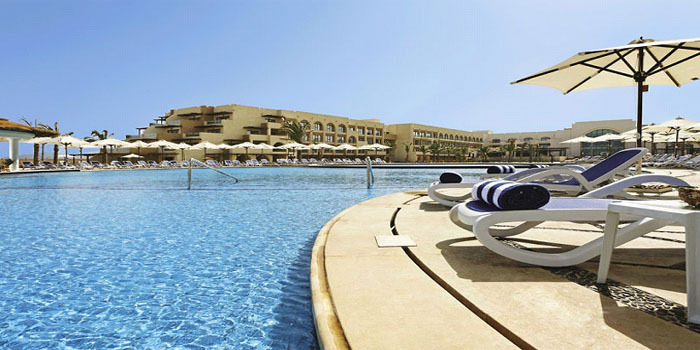 The Kempinski Hotel Soma Bay has 325 rooms and offers tennis courts, squash courts and a fitness centre. The resort also has a luxury spa, featuring a spa bath / jacuzzi and a sauna. 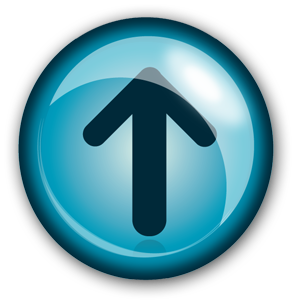 Guests can benefit from the available internet connection to stay in touch with friends during their trip. Rooms at the Kempinski Hotel Soma Bay are well-appointed and include all the essential amenities including bottled water, an iron and a flat-screen TV. All rooms are air conditioned and equipped with a sofa bed and a telephone. All rooms feature a private bathroom including a bathrobe and amenities. The Kempinski Hotel Soma Bay has its own on-site restaurant, perfect for those who wish to dine in. There is also an on-site bar, where you can enjoy a relaxing drink. Room service is available 24/7. Is an idyllic, exclusive haven situated in Abu Soma, Red Sea, Egypt; 50 kms Hurghada - Safaga Road; 52 kms from Hurghada; 45-minute drive from Hurghada Airport; 8 kms from Safaga City Centre; 569 kms from the capital city Cairo; 220 kms from the ancient city of Luxor; 319 kms from Aswan; 210 kms from Marsa Alam. Dive, surf, sail, cruise or simply indulge in the endless sky and sea in our private beach and Marina. We take pride in our own private beach, making it the perfect choice for family holidays or business stays. 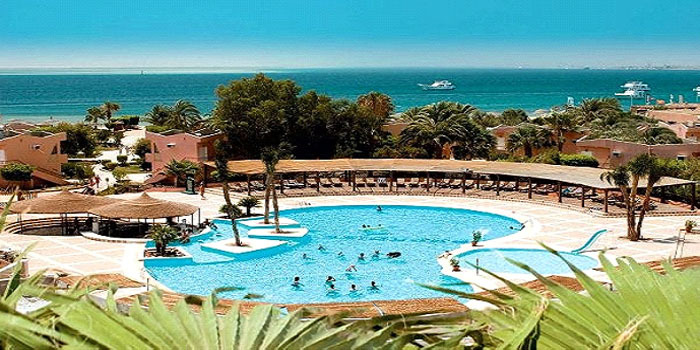 It is the ideal safe haven for families and couples alike, with unspoilt beaches, swimming pool, variety of restaurants, bars and cafes, diverse selection of leisure activities and outdoor sports, professional meeting facilities and much more. Located in the city’s prime diving and surfing site, Riviera Plaza Hotel & Resort, Abu Soma is the ultimate destination for contemporary style and luxury in the city. Overlooking the Red Sea, the hotel welcomes you with space and tranquility. Luxuriously appointed guestrooms have been meticulously designed with a host of classic features. The hotel presents a rich variety of dining experiences ranging from an all day dining restaurant serving oriental and themed dinners with live cooking stations, beach front outdoor restaurant offering international cuisine to romantic dining by the beach. An ideal place for business meetings and conferences, with a 24 hour business center, the hotel offers state of the art meeting facilities for business travelers throughout the year. A variety of fun and exciting recreational facilities and activities to keep the young and young-at-heart alike amused and entertained during their stay. Riviera Plaza Hotel & Resort is officially recommended by The Handicapped Scuba Association (HAS) for handicapped divers worldwide.The Hotel has 7 3-storey separate buildings, 327 rooms including 113 sea-view rooms and suites. Varying in size, our accommodations offer supreme comfort for living, business and entertainment. Luggage Storage. Please contact the Front Desk. The hotel offers a rich variety of dining experiences featuring various restaurants; cafes and bars offering a unique culinary journey that take guests to every region of the world – the famous hospitality of Arabia, the Latin flavors of Mexico and the traditional dishes of Germany and Italy. LEISURE: Embark on experiences that bring out the adventurer or sports enthusiast in you. Whether it's diving, snorkeling, wind surfing or a simple and relaxing island tour, take pleasure in a wide range of water sports and outdoor activities Riviera Plaza Abu Soma has to offer. Live life to the full at The Breakers Diving and Surfing Lodge, Egypt’s first watersports lifestyle hotel. Take advantage of quality lodging and a range of facilities designed specifically for the dedicated diver, kite surfer and wind surfer in one of the world’s finest locations for watersports. 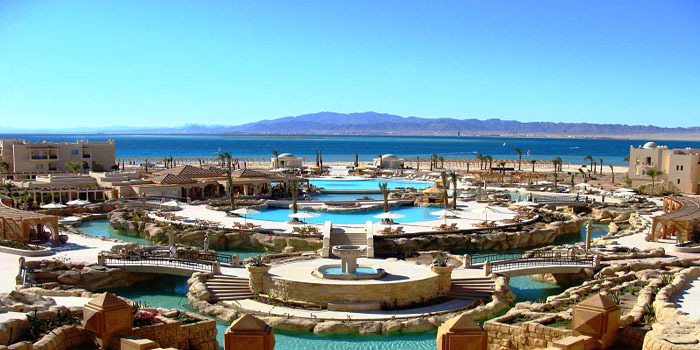 Enjoy access to top class leisure facilities in the deluxe resort destination of Soma Bay. After a day spent on or under the water, chill out in one of the panoramic bars, dining or waterfront relaxation areas. Feel the spirit of The Breakers Diving and Surfing Lodge. 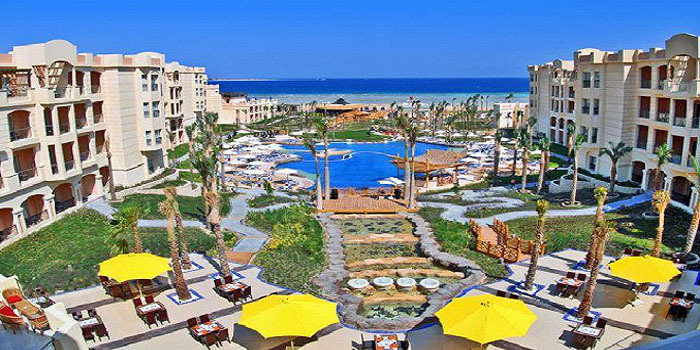 The Breakers Diving and Surfing Lodge is specially designed for guests wanting to take full advantage of Soma Bay’s world class facilities for watersports including scuba diving, snorkelling, kite surfing, wind surfing, catamaran and laser sailing. The Cascades, an 18 hole, par 72 award-winning Championship Golf Course, is designed by Gary Player and offers some of the finest golf in Egypt. A 9 hole, par 3 Challenge Course with an adjacent Golf Academy is ideal for individual and group tuition by PGA Golf Professionals. The Cascades has extensive practice facilities including a 60 bay driving range and equipment rental. Beach lovers are spoilt by one of the most beautiful stretches of beach in the Red Sea with white sand merging effortlessly into the turquoise calm waters. Meanwhile,excursions to Luxor, desert safaris and traditional Bedouin trips are available for those wanting to travel further afield. The Breakers accommodation surrounds a scenic swimming pool and relaxation area for lounging in the sunshine. Sun beds with comfortable matresses, sun shades and sun towels are all included. A fully equipped and air-conditioned Techno GYM allows you to work out whilst enjoying the sea view. A Finnish Sauna, also with panoramic sea views, is the highlight of the rooftop area.